Lately I have been visiting a few local flea markets looking for white ironstone or cream ware items, silver pieces, and old books. I have been lucky and have found quite a few of these. Today I want to share with you some of the very old books. I have mostly been looking for ones made out of leather. They have such great patina to them. I am adding them in my sitting room trying to create more of a library feel. Some of these old leather books can get quite costly. I was lucky to find a few at fifteen dollars or less. Most of these books are German so I certainly can't read them, but that is o.k. because I really bought them for the look. They just don't make covers like these anymore. Some of these date back to the 1800's. This is the inside of the cover. Look at all that color. The only one I can read is Canterbury Tales. This copy is from 1934. These are some more old books, but much cheaper since they are not leather. I am trying to get a mixture. I picked up this old decanter too to go with the library theme. I can just picture an English gentleman sitting in the big leather chair with an old book and his glass of scotch. Right now I have some of my design books mixed in until I get a larger collection of old books. Some of the old books were fifty percent off and I paid less that $2.50 for them. This is a box with a bird painted on it that I got for 50% off at a store closing sale. I was sad to see this home decor shop close like so many others in this economy. This old leather book is very worn. I just love that. Mr. Savvy had to glue this one back together for me. He thinks I'm crazy buying old books that are falling apart. I think it just makes them look better. This week I am joining the following parties. Please be sure and go visit these other lovely blogs and be inspired as I have. The talent of some of these bloggers just amazes me. I just finished commenting on your last post and discovered you had posted again...I need to get with it;)! I love these old books you found. They add so much character to your bookcase...you are so lucky to have found so many wonderful ones. The decanter is so pretty and looks great where you have it placed. Looks like your weekend was a success:)! Kim, your theme is coming together beautifully. I love old books too. Love the smell and feel of them. Love, love, love your old books and your mosaic. Beautiful! Kim, those are some great old books! I think I'm kicking myself for not buying more of the 25 cent ones while I could. You did great! Those are fabulous!! The one looks like granite! Your right. They do have that rich old patina to them. Awesome finds! Kim, You old books look great on your shelf! Sounds like a really fun day of shopping!! OH Kim...you know I love these! Great finds~ I just love the wonderful covers! Nice mosaic and the old leather bound books are a real find. Thanks for the visit. Yes, $60 is a bit much. I actually saw two of the green seltzer bottles this week and they were only $34.95. I'm sure they're only going to go up in price. Love your blog hon. Hi Kim, Love what you've done. Old books add character and class to a room. I love to decorate with books. They always seem to complete a scene. I love the old books. The are fabulous! Kim, I'm so glad you found Linda's Nifty Thrify meme, because these sure qualify! Great finds & even great talent to arrange them so artfully. Nice finds. I love old books - wished I had more room. Love your books. I just bought 5 large ones today. Can't wait to find a home for them tomorrow. Dropping by from Rhoda's. I love, love, love old books...I have been collecting for twenty years now. I would have snatched up a few of these too! That decanter is gorgeous. I just saw one yesterday at a yard sale and passed on it. Now I am kicking myself wishing I had bought it! I love the old books on your shelves. They add such character. I love old books! I have a Gone With the Wind one that my aunt gave me!! I just love it!! I can't find the pictures of your sitting room? Could you tell me what they are under? I was wanting to get some ideas. Thanks! Those lovely old books are wonderful. I can just imagine how good and musty they smell. That's one of my very favorite scents!! I have a pretty good collection myself, some old German ones, too. Yours are great - such pretty interior pages and spines. I think the thick one you bought (the one with the gold vertical design on the spine) might be Dutch. I wish I could translate the German one's title for you. My German is so very rusty...my Mom would not be pleased! Old books are so cool. Great old books. I have been trying to pick them up when I can. I haven't been able to acquire too many but I enjoy looking for them. Those books are sooooooooooooooooooooooooooo amazing!!!!! Great find! And the canter is superb with them! I need more shelves. I love the way you have these displayed. The color of the bookshelves is perfect. The old books have so much character - I especially love the old marbled papers - beautiful! Those are great books Kim! I have been on the hunt for old books too and had a little luck in the mountains last week. Your shelves look so nicely arranged. Hi Kim! Oh, what lovely olden books you're finding! I am loving seeing your room come together. You have great vision and your English looking sitting room. Love how you're dressing your shelves. I have the same artichoke as yours on the left. I love these, don't you? Your shelves look wonderful with all the old books. I love your old books!!! I've been meaning to leave a comment on here all day. Cody is home sick and I'm a single mom for the next 4 days. Ha! Anyway, I wanted to let you know that I love all your old books. I think they're so versatile. You can use them in any room and in any decor. It's so fun to start collecting them. Love what you've gotten so far! I love your treasures and how you arranged them on the bookshelves and your mosaic is great. Happy Monday to you! I love old books, new furniture & Grandbabies... Now that's the best! Next to your own children that is ; )! Ooooh...I love, love, LOVE old books! They really are a great decorating tool. Kim, I love your sitting room/library shelves and how you've accessorized them! They look fabulous and all of those beautiful old books look sooo GRAND!!! I also love that box with the painting of the bird! So pretty, my friend...you did a great job!!! Thank you for sharing your home with us!!! I agree! Old books convey such great character -- and they do look rich and warm in a bookcase. You got some great bargins, which make them even better!! I, too, have been searching for old leather books..I haven't found any yet that I can afford but I keep looking. I love your books and that decanter is awesome. Old books make such wonderful accessories! And I love the old decanter you found! Gorgeous vignette. The old books look awesome. You're right - they don't make em like they used to. Great finds! I just love old books! I like the mosaics with the way they are displayed! What a beautiful shelf! I particularly love those old books. They add a nice touch. Thanks for sharing! Your books are gorgeous. Such treasures and they look elegant in the bookcase. Great vignettes in there, too. Dropping by from Marty's. -- Jane F.
Amazing books! Really beautiful the way you displayed them. The decanter is so awesome too! Wonderful books. Love the look you are going for. The plate and decanter add to it. Lovely! I just love your old/new books. :) They are fabulous. I seem to find a lot of old books at our library. It has a used book store attached, a fund raiser for the library, and people donate books and the library also donates books that are out of circulation. Most range from $1.00 to $5.00 and some are quite old! Just an idea if you have something like that in your area. Love, love, love the old books!!! I enjoy the ones I have found here that belonged to my grandparents. There is something so connective about an old book. Lovely weather we are having here too! Although the pollen is crazy and there are weeds I could have never imagined spouting up everywhere. You have a really nice book collection...luv the leather ones! It's always so good to have some on hand to decorate with. Those books look so great on your beautifully accessorized shelves! Kim, You are creating a very handsome library space. I love old books myself. as a hobbyist book binder, I can tell you that no, they do not make books like that anymore! Beautiful examples! We seem to be looking for all the same things at the flea markets! Hope we don't go to the same ones! LOL! Lovely old books. I have quite a few that my parents collected years ago, plus some of their own childhood books, which I especially treasure. Books will never go out of style. Especially those older ones with such texture and the vintage feel. I don't have any older ones, so I had better get busy looking! You always know just how much of something to put where to make it look balanced! Great post! You have a wonderful blog. I will visit again and again. I, too, enjoy the look and feel of old books. Your book shelf arrangement does have a cosy English look to it - the square decanter is great! Your posts are quite inspiring - sometimes I just need a gentle push to get at a lingering project, and this was a lovely little push! I love old books too! I bought some at a garage sale a few weeks back and the lady wanted to know what ones I was interested in~she had them organized~I just wanted them for their "look". Those leather ones are gorgeous! How beautiful serie of old books ! they all have an old history , and so beautiful design for a home ! Old books really give your book case a nice look. I love decorating with books and usually have too many! I was fortunate to inherit my mother-in-law's old books--all of them classics. 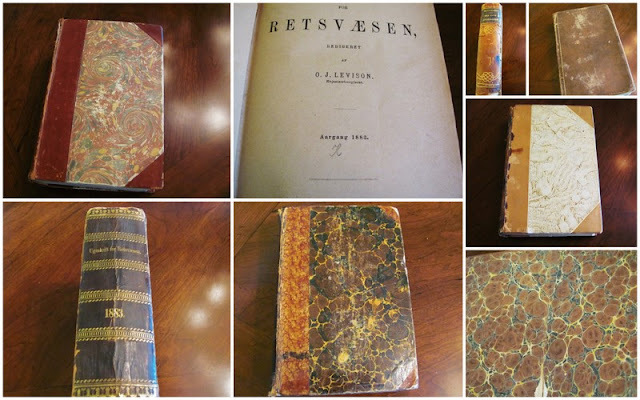 I saw lots of books like the ones you bought at Marburger, but they were Swedish. Love your transferware plate too. Hi Kim- The books add so much charm to a room, I love that you have decorated with them! Wonderful job! As always, thanks for your sweet comments! Wishing you a wonderful day! You are on the same page as me! Sorry, couldn't resist the pun. I love old books and featured ones from Oxford on my blog today. By the way, today is National Library Workers Day. Your books and vignette is lovely!! I love old books too! You've inspired me to write about it! Most of my books were from my grandparents. I'm hosting my first ever linky party on Friday. I hope you'll post this! Please do also pop by and visit my very special, 26th,'Tuesday Tea For Two', blog teaparty this week my dear! I love reading and books, Kim, so I love these old ones that you've found. They look great in your bookcase, too. On a side note, I was actually able to buy one of those keys like your sister's at Hobby Lobby online! With a 40% off coupon it worked out great. Thanks for letting me know where she got it! Fabulous old books! I had to laugh while reading your post as I can totally relate. I buy old books for their look instead of content as well. But I'm pretty sure that the two of us are not alone. I am always on the lookout for old books and I don't care what condition they are in. I love to decorate with them...or just hold them and carefully leaf through them. So precious...books! 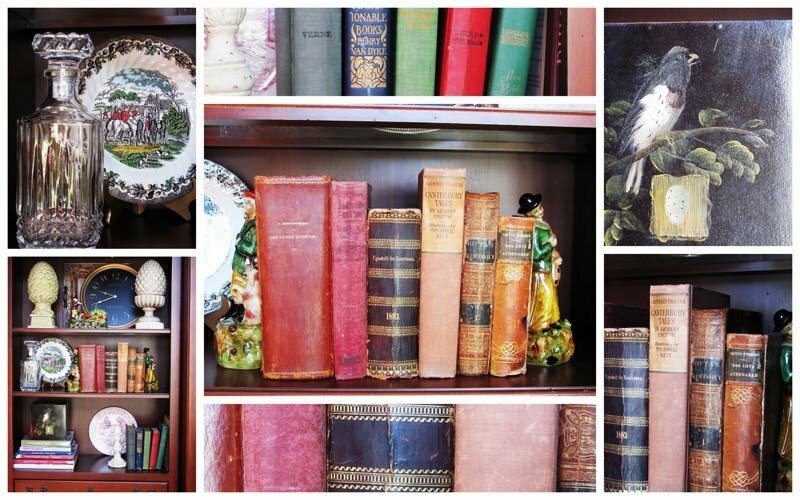 I love old books, they add so much character to a room! Yours are wonderful!